(CNN) -- President Reagan entered office in 1981 with two primary goals: to shrink government and to "make America strong again" by boosting the military. "Government is not the solution to our problems; government is the problem," Reagan said at his inauguration, signaling a challenge to what he called the "unnecessary and excessive growth of government." And, putting the international community, and particularly the Soviet Union, on notice, he warned, "Our reluctance for conflict should not be misjudged as a failure of will." With these ideas in mind, he set about drastically cutting taxes and government spending while building up the country's military. Reagan also pursued plans to pare down federal regulations and addressed trade issues, including problems created by the flood of Japanese auto imports. In February, 1981, Supreme Court Justice Potter Stewart announced his intention to retire making room for fulfillment of Reagan's campaign pledge to appoint a woman to the court. Later that year, Reagan nominated Arizona Appeals Court Judge Sandra Day O'Connor. Reagan had barely settled into office when an assassination attempt threatened to stop the so-called "Reagan Revolution" before it got off the ground. During an appearance at a Washington hotel, Reagan was shot by John Hinkley Jr., who later said he was trying to impress actress Jodie Foster by killing the president. With a bullet lodged just inches from his heart, Reagan handled the crisis with his trademark wit and self assurance. 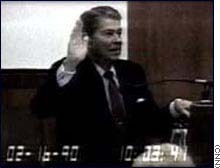 Upon meeting the doctor who was to remove the bullet, Reagan is said to have quipped, "I hope you're a Republican." Reagan recovered rapidly, boosting his image as a strong and resilient leader. No sooner was he back at work than he pursued his economic policies at full throttle. 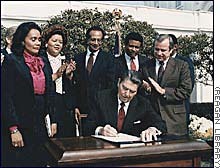 Americans had elected Reagan to fix the problems of double-digit inflation, high unemployment and high interest rates. With the cooperation of the Democratic Congress, Reagan cut taxes and government spending at the same time, a combination meant to stimulate growth in a "trickle-down" way from the rich to the rest. The immediate results of "supply-side" economics were mixed. The 1981 tax cuts, 25 percent phased in over three years, were the largest in history. Inflation dropped, but the nation lapsed into a deep recession that forced a tax increase -- also the largest ever at the time. With recession at hand, Reagan's fiscal policies, dubbed "Reagonomics," by critics, drew heavy fire. Unemployment was on the rise and Reagan's blue-collar supporters were defecting. Reagan urged Americans to "stay the course," and indeed, the economy did rebound. Wall Street surged and by early 1983, the economy was moving forward at a healthy clip. The recovery would last an unprecedented eight years. It was just the boost Reagan needed as he began to campaign for re-election. He ran against former Vice President Walter Mondale with a platform that played on America's renewed confidence. His campaign ads proclaimed, "It's morning again in America," and voters believed it. The election was a landslide. Reagan won every state except Mondale's home state of Minnesota becoming, at 73, the oldest person to be elected president. 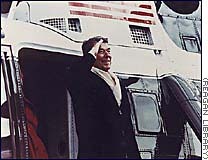 Reagan continued to pursue conservative fiscal policies in his second term. In 1986, he sold Congress on an overhaul of the income tax code, eliminating numerous deductions and exempting millions of low-income people. He also slashed social programs, including Aid to Families with Dependent Children, school lunches and subsidized housing, earning him critics among advocates of the poor, who likened him to Herbert Hoover. But Reagan didn't see it that way. By most accounts, he genuinely believed he was creating opportunity for the disadvantaged. He spared Social Security and promised to maintain a "safety net," for the elderly, disabled and needy. Still, by the time he left office, the disparity between rich and poor Americans was at an all-time high. 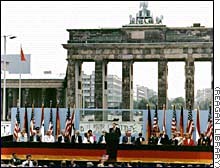 In a June 1987 speech at the Berlin Wall's Brandenburg Gate, Reagan told his Soviet counterpart, "Mr. Gorbachev, tear down this wall." While Reagan cut social programs, he dramatically increased defense spending in the belief that the way to prevent a nuclear war was to have more weapons than the enemy -- in this case the Soviet Union. From a position of strength, he said, he would negotiate the end of nuclear weapons buildup. It was a theory that many Americans did not share. Thousands held protests across the country, worried that the arms race would lead to disaster. But Reagan held firm, and defense spending grew 35 percent for the nation's largest-ever peacetime buildup. Reagan also invested in his Strategic Defense Initiative, which promised to deflect incoming missiles with shields in space. Scientists derided the idea, calling it "Star Wars," but Reagan insisted on research. Tax cuts and the largest military buildup in peacetime history did not come without a price. The federal deficit ballooned under Reagan's leadership, a situation the president blamed on Congress for not doing enough to cut federal spending. While Reagan viewed himself as a champion of Everyman, he did much to please the business barons, removing government regulations said to be stifling growth and firing illegally striking air traffic controllers in 1981. While deregulation had been one of the primary objectives of the Reagan Administration, results were mixed, with many of the targeted regulations dealing with health and safety standards being restored by the courts. Results were also mixed on social issues. Whether or not it was owing to Nancy Reagan's much-maligned "Just Say No," campaign, drug use among high school students was declining as Reagan left office. AIDS, however, was on the rise, a trend some health officials blamed on a lack of White House leadership on the issue. Crime levels remained more or less the same. "He was modest about his achievements and willing to share the credit with others, but he refused to acknowledge mistakes," biographer Lou Cannon observed. If Reagan's first term was defined by economic issues, his second was defined by his efforts to end the Cold War. Reagan's international policies were based on an abiding antipathy for communism and a belief in the United States as a moral compass. The defense buildup was a key component of the attempt to stare down what Reagan termed the "evil empire" -- the Soviet Union. That obsessive passion of anti-communism had been with the president since his days in Hollywood. 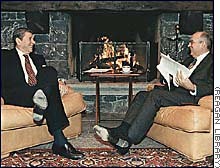 Amid the tough talk, Reagan met several times with Soviet leader Mikhail Gorbachev. In 1987, the men signed a treaty to eliminate intermediate-range nuclear missiles. Reagan's international record was hardly without controversy. He persisted in 1985 with a planned visit to a German cemetery where some Nazi secret police were buried, despite criticism from Jewish groups. Reagan also relied on the military to respond to international problems -- sometimes with mixed results. He sent Marines into Lebanon as peacekeepers. But in 1983, the peacekeepers themselves were attacked; a bombing at their Beirut barracks killed 241 troops. When Reagan left office in 1988, extremists still held Americans hostage in Lebanon. Also in 1983, American troops were called on to squelch a communist coup on the Caribbean island of Grenada. Critics claimed it was a risky overreaction. Libya also proved problematic. In 1986, Reagan ordered a bombing raid on Libya after evidence emerged that Libyan terrorists attacked U.S. soldiers at a West Berlin nightclub. And in 1988, near the end of Reagan's tenure, Pan Am Flight 103 exploded over Scotland, killing 270 people. Again, Libyans were blamed. Reagan also carried his anti-communist push into Central America, where he sent arms and advisers to counter the Soviet Union's aid to the government in Nicaragua and rebels in El Salvador. It was Reagan's ideological push south, combined with his management style of leaving policy details to advisers, that led to the scandal of his career. "Reagan lacked a technical grasp of any issue, and he was usually bored by briefings. ... Most of his aides thought of him as intelligent, but many also considered him intellectually lazy," Cannon wrote. Reagan had directed aides to find ways to help the Contras, Nicaraguan rebels fighting the leftist Sandinista government, after Congress barred further aid. He had authorized a CIA operation in Nicaragua in 1981. But, as usual, the specifics of implementation were left to others. Marine Lt. Col. Oliver North and others in the administration operated the secret arms pipeline, which collapsed with public disclosure in 1986. Money from illegal arms sales to Iran was used to help finance covert support of the Contras. Arms sales were also made to Iran in an attempt to win its influence in Lebanon to negotiate the release of American hostages. Reagan had categorically denied he would ever trade arms for hostages, and said after the Iran-Contra scandal emerged that he never knew of diversion of funds to the Contras or even that excess funds existed. Independent prosecutor Lawrence Walsh concluded in 1994 that there was no evidence Reagan or Vice President George Bush had broken the law, or that they knew of the diversion of money. But Walsh said Reagan "knowingly participated or at least acquiesced" in the cover-up, and that Bush withheld evidence and "was fully aware of the Iran arms sales." 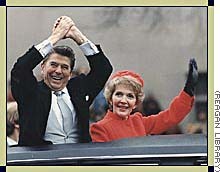 Despite the Iran-Contra scandal and the 1987 stock market crash, the Reagan Revolution didn't end with his second term. Bush rode his boss's coattails into the Oval Office in 1988. In assessing the Reagan's presidential legacy, biographer Lou Cannon wrote, " Reagan may not have been a great president, but he was a great American with a compelling vision of his country. " Historians will no doubt continue to debate the effectiveness of Reagan's policies, but few will dispute the patriotism and personal charm of one of America's most popular presidents.